2015 International Invitational Quilt Exhibition featured quilter was Margarete Heinisch, originally from Austria, now living in California. 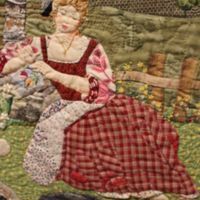 This year's show included quilters from all over the United States, as well as from the United Kingdom, Canada, Russia, Germany, Netherlands, and Austria. The annual quilter's workshop with Margarete Heinisch was on July 18. "Painting with a Paintbrush" gave participants the opportunity to create a flower that Heinisch selected from her art quilt "Persephone Smiles". The exhibition was open July 1, 2015 and will show through August 29, 2015. 2014 International Invitational Quilt Exhibition featured quilter was Zena Thorpe. The workshop was called "Holes as a Design Element" by Birgit Schuller, Germany. 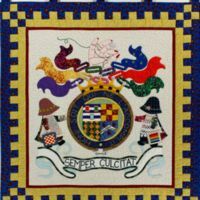 The exhibition included quilters from all over the United States, as well as from the United Kingdom, Germany, and Nova Scotia. This exhibition opened July 1, 2014 and was shown through August 23, 2014. 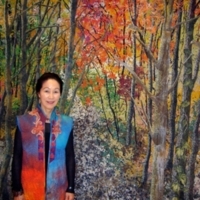 Nature's vast magnificence awakens in the landscape quilts designed by Noriko Endo and the flower pieces created by Helen Butler. Endo's quilts are full of sunshine and greenery, while Butler's pieces glide from one spectacular hue to another. Other artists showing off their command of designing, piecing, and quilting are Lenore Crawford, Michigan; Kaye Evans, Utah; Linda French, Ohio; Suzanne Marshall, Missouri; Kathy McNeil, Washington; Andrea Perejda, California; Sharon L. Schlotzhauer and David M. Taylor, Colorado; Kate Themel, Connecticut; and Zena Thorpe, California. We appreciate the quilters rambling off the beaten path to create works from visits to the Greek island of Santorini, the medieval village Le Poet-Laval in central France, and Huangshan in the Yellow Mountains of China, to name a few locales. 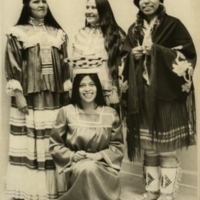 Outside the Homeland: The Intermountain Indian School features, from beginning to end, the story of the Intermountain Inter-Tribal Indian School that was located in Brigham City, Utah. Outside the Homeland was on exhibition during Spring of 2012. Funds to support this exhibition and associated programs have been provided by the Utah Humanities Council in collaboration with the Utah Division of Arts and Museums. Any views, findings, conclusions, or recommendations expressed in this exhibition and associated programs do not necessarily represent the views of the National Endowment for the Humanities or the Utah Humanities Council. The exhibit was curated by Kaia Landon and Katie Conrad. Carol Tonnies and Joanne Penrod helped acquire oral histories from former students of the school. Oral histories with former faculty and staff were completed by Kathy Bradford. A very special thank you to the former students and staff of Intermountain who generously agreed to be interviewed. Thank you also to the many community members who donated artifacts to the museum for this exhibition, as well as Benjamin Barney and others who participated in the panel discussions.